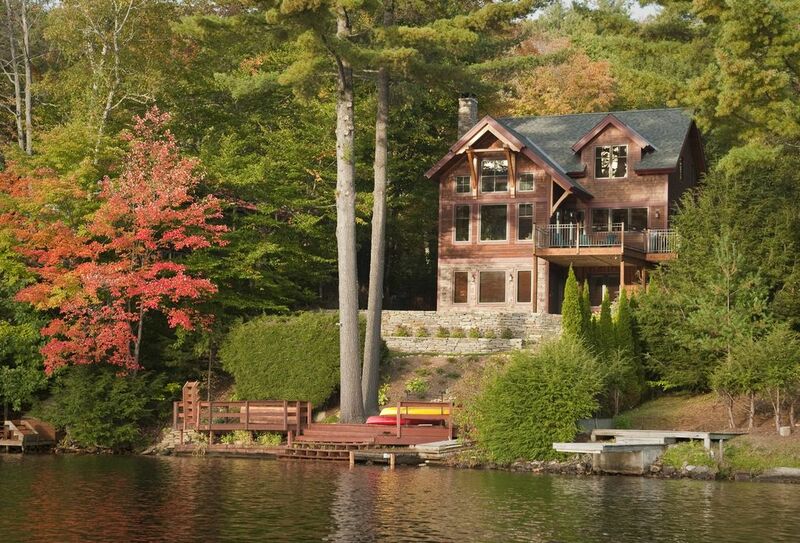 Our luxury 3,500 SF timberframe home is located directly on Lake Rescue and close to Okemo and Killington ski areas. The views of the lake and mountains are spectacular and the location is wonderful all year round. Our Bensonwood designed timeberfame house (also known as a post and beam house) is characterized by beautiful Douglas Fir beams, towering cathedral ceilings, and a wide open main floor. The home has 4 bedrooms and 3.5 baths. Three bedrooms have queen beds, and one large bedroom with built-in beds. The house can comfortably sleep 6. to 8 depending upon sleeping arrangements. We do limit occupancy to keep the house in excellent condition for future guests. The house has three levels; main, upper and lower. The main level has a “Great Room” with cathedral ceiling, exposed beams, a fireplace, and large windows overlooking the lake. The kitchen has cherry cabinets, a large granite counter, stainless appliances, and an island which seats five. The dining room has a large cherry table. A half bath is on the main level. The kitchen and Great Room open to a deck with an outdoor grill, picnic table and lovely views of the lake. The upper level contains the master bedroom (with master bath), a loft, and a large bedroom with built-in beds, bathroom and a TV. The master bedroom overlooks the lake. The master bath has a walk-in shower and a large soaking tub. All bathrooms have granite counters and travertine tile. The loft overlooks the Great Room and has wonderful views of the lake, a sofa and TV and is a great place to escape to read. There is a full size washer and dryer on both the upper and lower levels. The lower level has two bedrooms with queen beds, a full bathroom with walk-in shower, and a family room with a gas fireplace and which directly faces the lake. There is a second laundry room with a full size washer and dryer as well as a second refrigerator on the lower level. Lake Rescue is a beautiful small, (usually) quiet and peaceful lake. It is about 1 mile long in the shape of a “figure 8”. Our house is located in the quiet eastern side of the “Round Pond” section at the northern end. Although power boats and water skiing are allowed, kayaks and fishermen predominate. Wide stairs from the lower lake-side deck provide easy access to the lake where there is a generally sandy bottom. Multiple kayaks (both adult and youth) and a canoe are available to explore Lake Rescue. The nearby village of Ludlow contains many fine restaurants, while nearby Chester is known for its fine antique stores. Weston, only a 15-minute drive away, is home to the famous Vermont Country Store and Weston Playhouse and also the beautiful Weston Priory. Manchester, is well known for its many designer factory outlets and Woodstock, Vermont for picture post-card beauty and typical New England charm. Okemo has many activities including a beautiful 18-hole Okemo Valley Golf course, mountain biking, outdoor concerts, a “mountain coaster”, zip lines, a climbing wall, and miniature golf. In the fall, the foliage is spectacular. It is also a great place to enjoy a hike in the surrounding woods or antiquing in neighboring towns. In winter, the house is ideal for outdoor activities. The house is about three miles from Okemo and 12 miles from Killington’s Northeast chairlift. Nearby Okemo Valley Cross Country Ski Center has extensive groomed trails and when conditions are right, cross country skiing or ice skating on Lake Rescue is wonderful. Snowmobilers can utilize the lakes and the nearby access to all the interconnecting trails that Vermont offers (one-fourth mile from Lake Rescue). It is in the perfect location for swimming, boating, skiing and viewing VT foliage. This property had a 1940's or 50's cottage on it when we purchased it in 1983. It served as our family retreat as our children grew up and also fell in love with VT, Lake Rescue and Okemo. Our daughter had such fond memories of VT, she decided to get married nearby. As our family grew, in 2008 we decided to completely rebuild the house so it could accommodate them. It continues to be our family retreat and is our dream home. Bathroom 3 in "children's bedroom"
toilet, combination tub/shower, Private bathroom in "children's bedroom"
Lake Rescue is a wonderful lake for swimming, boating and fishing. It is a quiet lake and our waterfront is easily accessible via a few wooden steps onto a sandy lake bottom and ideal for children. House is directly on the water, with views of the water and mountains from all levels of the house. The waterfront is sandy and wide stairs allow for easy access to water. We have a dock for fishing swimming or boating. We have a beautiful kitchen overlooking the lake with granite counter tops, a large breakfast counter, and stainless appliances. Deck and patio both overlook the lake and have spectacular views of the lake, mountains, and of Okemo. House is on 3 levels, making access for those with disabilities challenging. There are no sleeping accommodations on the main floor. Stairs are relatively easy to navigate since they are wide with "landings" half way up. Our Bensonwood timeberfame house (also known as a post and beam house) is characterized by beautiful Douglas firm beams, towering cathedral ceilings, and a wide open main floor. The Great Room is open to the Kitchen and Dining Room. This openness makes it possible for everyone to be included in family or group discussion or activities, no matter where they are on the main level. Located on the sunny (east) side of Lake Rescue, only a few miles from Ludlow and skiing at Okemo and Killington. A short distance from Weston and Manchester VT. -- The nearby village of Ludlow, Vermont contains many fine restaurants. Other close-by towns include Chester, which is known for its fine antique stores. Weston, only a 15-minute drive away, is home to the famous Vermont Country Store, Weston Playhouse and also the beautiful Weston Priory. Manchester, is 35 minutes away and is well known for its many designer factory outlets. Woodstock, is known for picture post-card beauty and typical New England charm. Golf: The beautiful and recently renovated and expanded 18-hole Okemo Valley/Fox Run Golf course is nearby as is the wonderful Killington Golf Course and Golf School. Ski: World class Okemo Mountain is 4 miles away, and Killington is about 10 miles. Lake Rescue usually has excellent conditions for cross-country skiing and the scenery is always beautiful. A full loop of the lake is approximately four miles. If you tire of exploring Lake Rescue, Echo Lake and Amherst Lake are easy to reach via interconnecting trails. Nearby Okemo Valley Cross Country Ski Center has extensive groomed trails for classical or skating skiers. Ice fisherman love the lakes, and when the conditions are right, the ice skating is also good. Snowmobiles can utilize the lakes and the nearby access to all the interconnecting ski trails that Vermont offers (one-fourth mile from Lake Rescue). Once on the trails, you can even ride into Canada.